Our large bar serves food daily, from light snacks to hearty dinners. 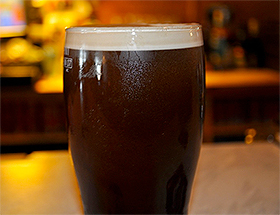 If you would just like to wet your whistle our porter is some of the best in the country! For the busier part of the season our restaurant is open for lunch and evening meals where fresh seafood (when the season allows!) and wholesome Irish dishes are our speciality. Group bookings for lunch and evening meals are very welcome. The chef would be happy to discuss your meal preferences with you, and arrange a menu that suits your needs. A great atmosphere with traditional Irish Music and food served in the Bar.